Brazil’s World Cup dreams ended in humiliating and brutal fashion as Germany inflicted their heaviest defeat in the first semi-final in Belo Horizonte.A thunderous occasion that began with Brazil riding a tidal wave of emotion was reduced to a nightmare as Germany were 5-0 up inside 29 remarkable minutes in front of a disbelieving Estadio Mineirao crowd. Brazil’s players mourned the absence of the injured Neymar before kick-off, but captain Thiago Silva was an even bigger loss. The result was their first competitive home defeat in 39 years, and the end of their hopes of making it to the World Cup final at the iconic Maracana on Sunday. Thomas Muller gave the three-time winners an early lead before a period of utter chaos saw Miroslav Klose break the World Cup scoring record, Toni Kroos add two more in the space of 179 seconds and Sami Khedira net a fifth. Chelsea striker Andre Schurrle, on as a substitute, added two more after the break before Brazil’s followers delivered what must be regarded as the defining insult to their national team – cheering every German pass and applauding their goals. This equalled Brazil’s heaviest margin of defeat, a 6-0 loss at the hands of Uruguay in the 1920 Copa America, but the impact of this reverse, not just on the world stage but in their homeland, will put this alongside the 1950 World Cup final defeat by the Uruguayans in Rio as their darkest football day. Muller’s early goal was a big enough setback, but the manner in which Luiz Felipe Scolari’s side crumbled in the space of seven minutes is likely to be a matter of national debate in this country for years to come. This was Brazil’s first defeat at home for 12 years. The loss for a country built on sporting pride, and at their own World Cup, will be bad enough to take. The scale of defeat will take the inquests to a new level. The five-time champions’ team coach bears the phrase “Brace Yourself – The 6th Is Coming”. It did indeed arrive, but only in the back of Julio Cesar’s net. With all David Luiz’s defensive indiscipline offering rich pickings for Germany’s speed and mobility, the game swiftly descended into a fiasco for Brazil. Much has been made of their over-emotion and there was, in retrospect, an overblown public reaction to the absence of Neymar, injured in the quarter-final against Colombia, in the hour leading up to kick-off. Scolari led his players off the team coach wearing a white “Forca Neymar” baseball cap before captain Luiz and goalkeeper Cesar held up his number 10 shirt during a stirring rendition of Brazil’s national anthem. It was all downhill, and rapidly, for Brazil from the moment Muller was the beneficiary of dreadful marking to steer in Kroos’s corner. Brazil simply fell apart and it was an invitation Germany were not going to refuse as Klose scored at the second attempt to set a new World Cup record of 16 goals in only 23 games. What followed was one of the most remarkable passages of play in any World Cup game, let alone a semi-final, as Germany did not just look like scoring on every attack, they invariably did. Throughout this World Cup there has been a suspicion a mediocre Brazil defence has been disguised. With the shield of Silva removed, they were simply taken apart by Germany, wilting under pressure and abject in coping with their attacking variety. Kroos side-footed home a finish Cesar touched but could not save, then the midfielder quickly added another when set up by the unselfish Khedira. Khedira added another before half-time in an example of the complete disintegration of Brazil’s organisation, discipline and basic defence. He strolled towards the penalty area untroubled before exchanging passes with Mesut Ozil to score. It was only then, perhaps as full recognition sunk in, that Brazil’s supporters started to deliver a toxic reaction to their team, with striker Fred singled out for vicious treatment. Despite a lively start to the second half that saw Germany keeper Manuel Neuer distinguish himself, normal service was resumed as Schurrle finished off a fine passing move before drilling a near-post finish past Cesar, who should have done better. It was at this point the home fans threw their support behind Germany, cheering passing moves and even breaking into applause for Schurrle’s goal. Oscar’s late strike was nothing in the way of consolation to them and they turned savagely on their players – many of whom left the pitch in tears – at the final whistle. 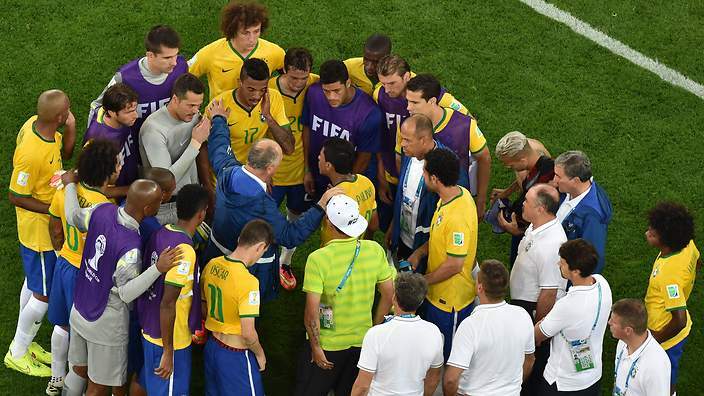 Brazil knew their World Cup dream might have to end. No-one suspected for a moment it would end like this.